A record-high 98 percent of newly minted university graduates landed jobs at the beginning of this fiscal year, government data showed Friday, reflecting a recovering economy. The employment rate of job-seeking graduates rose 0.4 percentage points from a year earlier, up for the seventh consecutive year, in an annual survey that’s been conducted since 1997 by the labor and education ministries. Aided by firms’ increasing appetite for recruitment, the rate of university students seeking jobs also increased to 75.3 percent, the highest on record. A labor ministry official attributed the rises to an economic turnaround that has provided students with more opportunities to apply for positions that match their preferences. The employment rate among new high school graduates who sought jobs as of the end of March gained 0.1 percentage point to 98.1 percent, up for the eighth straight year. “Enhanced collaboration between Hello Work (public job-placement offices) and universities or high schools, as well as improved career education, have contributed to the strong figures,” education minister Yoshimasa Hayashi told a news conference. The employment rate of university graduates who majored in humanities climbed 0.9 percentage points to 98.2 percent while that of those who majored in science-related fields fell 1.5 percentage points to 97.2 percent. It was the first time the figure for science majors fell below that for humanities majors. The labor ministry official said there may have been more science graduates who were willing to defer employment in order to obtain qualifications required by their preferred companies. 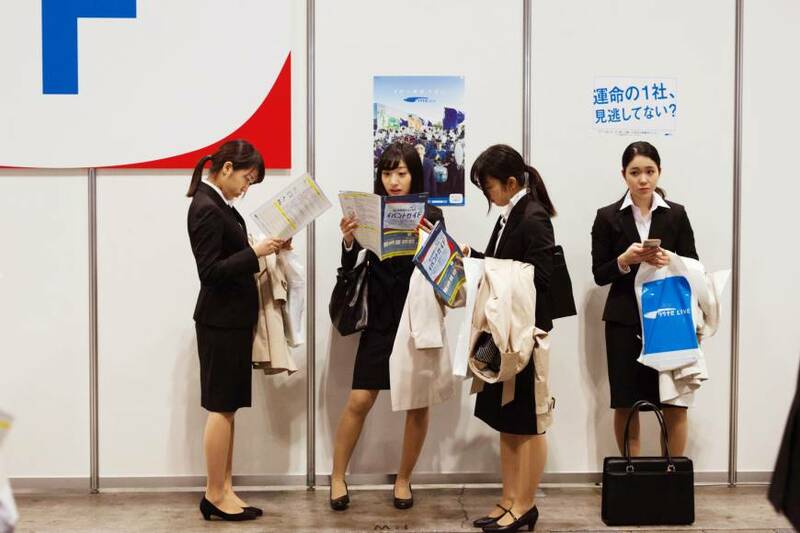 The new university graduates’ employment rate has recovered from a record low of 91 percent in the spring of 2011, weeks after the March earthquake and tsunami disaster struck northeastern Japan. 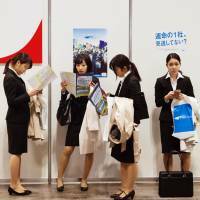 In a separate survey that covered all high school students in Japan, around 188,000 students sought jobs out of around 1,061,000 students. The seller’s market is expected to continue this fiscal year on the back of labor shortages — except for some industries such as major banks, which have decided to slash new hires, experts said. According to Recruit Career Co., the proportion of students who secured informal job offers for the next fiscal year stood at around 43 percent as of May 1, up 7.7 percentage points from the previous year.